YAH’S Calendar is the best! YAHUSHUA HA MASHIACH The TORAH (YAH’S WORD Made Flesh as per Yahuchanan/John 1) had HIS own specially set apart day for a Brit Mila and Naming. Adam and Eve were taught by YAH Almighty to set a special day for Naming each of their children and another special day for Dedicating each of their children. This tradition carried on down the generations to-date. It has never been done away with! This is recorded in the Second Book of Adam and Eve. Note that Malach/Angel GabriEL had already appeared to Miryam/Mary around Chanukah/Hanukkah (a.k.a Feast of Dedication & Feast of Lights) at which time, YAHUSHUA’S conception, birth and name were announced. 21 Eight days after his birth, the child was circumcised and named YAHUSHUA. This was the name the angel had given him before his mother became pregnant. 25 A man named Simeon was in Jerusalem. He lived an honorable and devout life. He was waiting for the one who would comfort Israel. The Holy Spirit was with Simeon 26 and had told him that he wouldn’t die until he had seen the Messiah, whom the Lord would send. 31 which you have prepared for all people to see. 36 Anna, a prophet, was also there. She was a descendant of Phanuel from the tribe of Asher. She was now very old. Her husband had died seven years after they were married, 37 and she had been a widow for 84 years. Anna never left the temple courtyard but worshiped day and night by fasting and praying. 38 At that moment she came up to Mary and Joseph and began to thank God. She spoke about YAHUSHUA to all who were waiting for Jerusalem to be set free. 39 After doing everything the Lord’s Teachings required, Joseph and Mary returned to their hometown of Nazareth in Galilee. 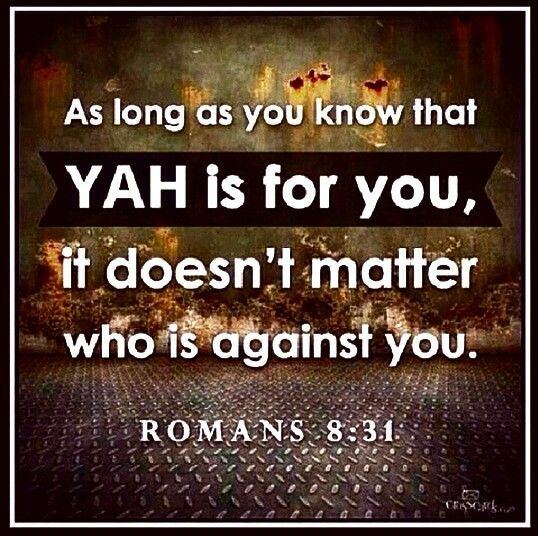 Firstly, we are able to determine that YAHUSHUA HA MASHIACH’S cousin, YAHuchanan the Immerser/John the Baptist was conceived in mid-Sivan on the Jewish Calendar (which falls around May/June on the Roman Gregorian Calendar). He was later born on the Passover, which falls on the 15th of the Hebrew month of Nisan. This was 40 weeks. 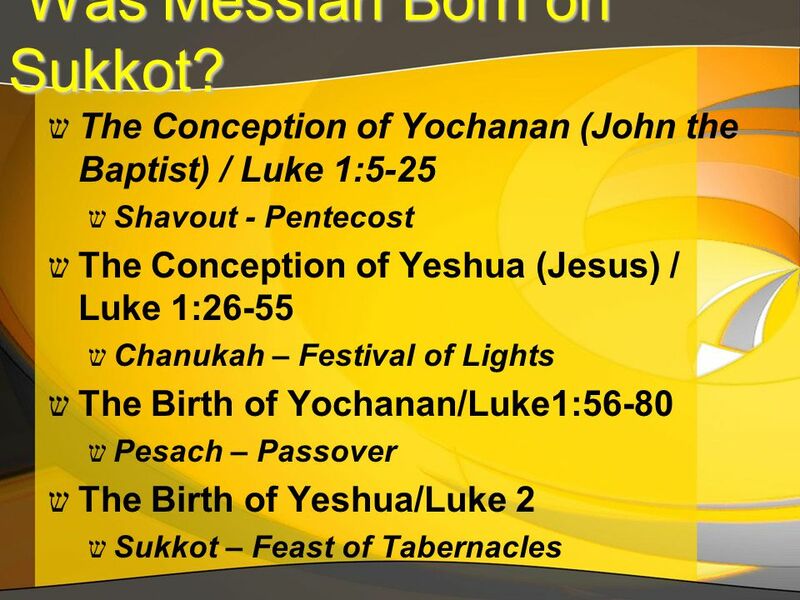 YAHUSHUA was conceived in late Kislev (Nov/Dec) and born 40 weeks later during Sukkot. ……More information to be added…. a. We know that Yahuchanan’s/John’s father (Zakaryah/Zachariah) was a Levite who was assigned to serve in the Temple during the course of “Abia” in the 8th course of the year (Luke 1:5, 1 Chronicles 24:10). 5 In the days of Herod, King of Judah, there was a kohen named Zechariah from the priestly division of Abijah. 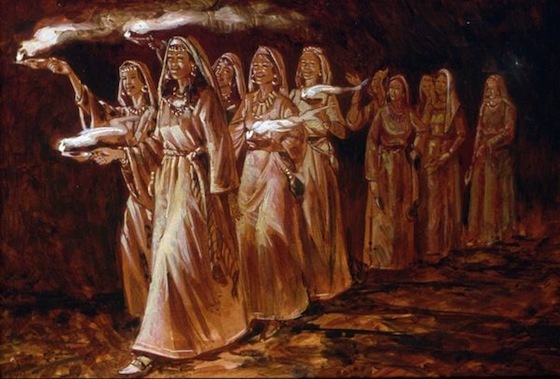 [a] Elizabeth, his wife, was from the daughters of Aaron. 24 Now these were the divisions of the sons of Aaron. The sons of Aaron were Nadab and Abihu, Eleazar and Ithamar. 2 But Nadab and Abihu died before their father and had no children, so Eleazar and Ithamar served as kohanim. 3 David, with Zadok of the sons of Eleazar and Ahimelech of the sons of Ithamar, divided them into their offices according to their avodah. 4 More leading men were found among the sons of Eleazar than among the sons of Ithamar, so they divided them: the sons of Eleazar had 16 leaders of clans and the sons of Ithamar had eight leaders of clans. 5 Thus, they were impartially divided by lot for there were officials of the Holy Place and officials of God, both from the sons of Eleazar and from the sons of Ithamar. 6 The scribe Shemaiah, son of Nethanel from the Levites, recorded them in the presence of the king, the princes, Zadok the priest, Ahimelech son of Abiathar, and the leaders of the clans of the kohanim and of the Levites: one clan taken for Eleazar and one for Ithamar. 7 Now the first lot came for Jehoiarib, the second for Jedaiah, 8 the third for Harim, the fourth for Seorim, 9 the fifth for Malchijah, the sixth for Mijamin, 10 the seventh for Hakkoz, the eighth for Abijah, 11 the ninth for Jeshua, the tenth for Shecaniah, 12 the eleventh for Eliashib, the twelfth for Jakim, 13 the thirteenth for Huppah, the fourteenth for Heshebeab, 14 the fifteenth for Bilgah, the sixteenth for Immer, 15 the seventeenth for Hezir, the eighteenth for Hapizzez, 16 the nineteenth for Petahiah the twentieth for Jehezkel, 17 the twentyfirst for Jachin, the twentysecond for Gamul, 18 the twentythird for Delaiah, the twentyfourth for Maaziah. 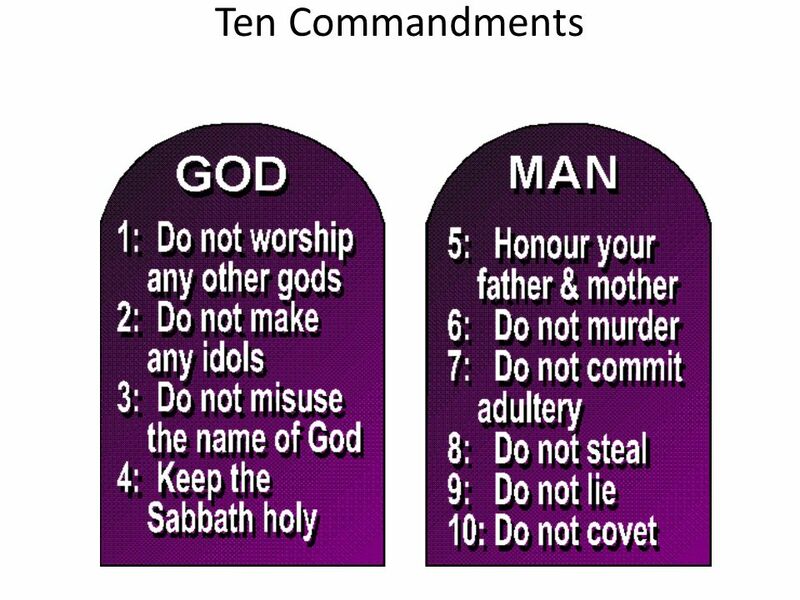 19 These were their duties for their avodah upon entering into the House of Adonai according to the ordinance given to them by the hand of Aaron their father, just as Adonai the God of Israel had commanded him. 23 The sons of Hebron: Jeriah, Amariah the second, Jahaziel the third, Jekameam the fourth. the sons of Jaaziah: Beno. from Jaaziah: Beno, Shoham, Zaccur and Ibri. Eleazar, who had no sons. 29 From Kish, the sons of Kish: Jerahmeel. 30 The sons of Mushi: Mahli, Eder and Jerimoth. These were the sons of the Levites by their clans. 31 These also cast lots even as their kinsmen the sons of Aaron did in the presence of King David, Zadok, Ahimelech and the heads of the clans of the kohanim and the Levites—the families of the oldest just like those of his youngest brother. b. Since the cycle of service in the Temple began on the first Shabbat of Nisan (i.e. we know that the ecclesiastic calendar starts at the new moon before Passover — which is the 1st of Nisan). We also know that both Passover and Shavu’ot required all priestly courses to serve. We can calculate that the actual time of the 8th course where Zachariah served in the Temple was during the 10th week of the year, this would be at the beginning on the second Sabbath of the month of Sivan (May/June). c. It is written that Yahuchanan the Immerser/John the Baptist was conceived shortly after Zachariah’s service in the Temple (Luke 1:23-4) — which would be somewhere around the third Sabbath of the month of Sivan (i.e., late Sivan). d. Assuming a full-term pregnancy (and the Scripture does not indicate otherwise), Yahuchanan the Immerser/John the Baptist was born around Passover (Nisan 15). e ) The People of Israel have always expected Eliyahu Ha Navi/Prophet Elijah to come at Passover and herald the coming of the MASHIACH. 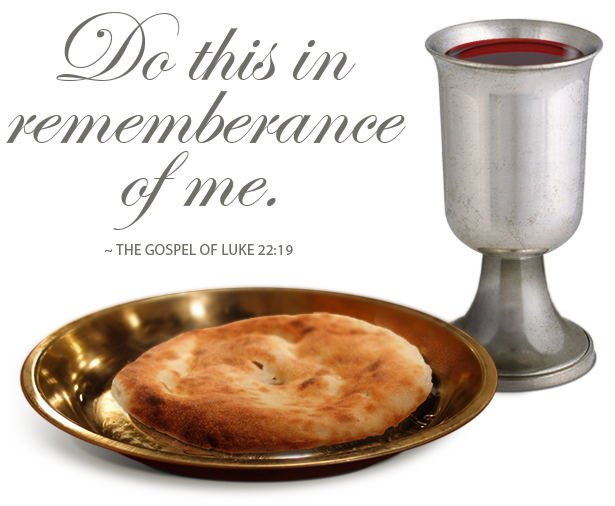 and even today it is customary for the People of Israel/Jews to set out a special cup of wine during the Passover Seder meal in anticipation of the arrival of Eliyahu/Elijah for the festival. 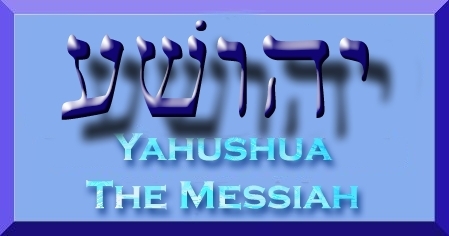 YAHUSHUA HA MASHIACH said that Yahuchanan the Immerser/John the Baptist was a type of Elijah the prophet (Matt 17:10-13, cp. Luke 1:17), therefore it is no surprise that Yahuchanan The Immerser/John the Baptist (a type of Elijah) was born at Passover. 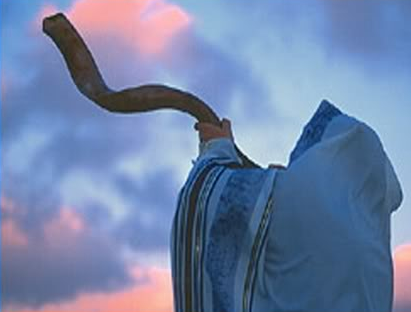 11 YAHUSHUA replied, “Indeed, Elijah is coming and will restore all things. [a]12 I tell you that Elijah already came; and they didn’t recognize him, but did to him whatever they wanted. In the same way, the Son of YAH is about to suffer at their hands.” 13 Then the disciples understood that He was speaking to them about John the Immerser. 17 And he will go before Him in the spirit and power of Elijah, to turn the hearts of fathers to the children[a] and the disobedient ones to the wisdom of the righteous, to make ready for Adonai a prepared people. a. We know that YAHUSHUA HA MASHIACH was conceived six months after Yahuchanan the Immerser/John the Baptist was conceived (Luke 1:24-27, 36) and that Yahuchanan the Immerser/John the Baptist was conceived in late Sivan. So, six months after late Sivan is late Kislev. It is important to note here that the “sixth” month refers to the sixth month of Elisheva’s/Elizabeth’s pregnancy, not the 6th Jewish month of Elul (cp. Luke 1:36). 26 Then in the sixth month, the angel Gabriel was sent by Adonai into a town in the Galilee named Natzeret 27 and to a virgin engaged to a man named Joseph, of the house of David. The virgin’s name was Miriam. 36 Behold, even your relative Elizabeth has conceived a son in her old age; and the one who was called barren is six months pregnant. b. Placing the time of the conception of YAHUSHUA HA MASHIACH in late Kislev also makes sense of the fact that He is called the LIGHT OF THE WORLD (John 8:12, 9:5, 12:46), as the first day of the Jewish festival of Chanukah (the Festival of Lights / Feast of Dedication) is the 25th day of Kislev. Based on the above, we can place the time of Jesus’ conception during the Jewish Festival of Chanukah. Yeshua replied, “What have I been telling you from the beginning? 46 As light I have come into the world, so that everyone who trusts in Me should not remain in darkness. c. Adding six months from the 15th day of Nisan (Yahuchanan the Immerser/John the Baptist’s birthday), we arrive at the 15th day of the 7th month, Tishri – the first day of the festival of Sukkot. d. In accordance with the Law of Moses, YAHUSHUA HA MASHIACH would have been circumcised the “eight day” after birth. Given HE was born on the first day of Sukkot, the eighth day falls on a significant day on the Jewish calendar called Shemini Atzeret / Sinchat TORAH, which, like the first day, is a day of sacred assembly (Leviticus 23:39). On this day, the Jews complete their annual cycle of TORAH readings and start again from Bereshit (Genesis), therefore Simchat TORAH is considered by the Jews to be a time of “fulfillment” of the TORAH. 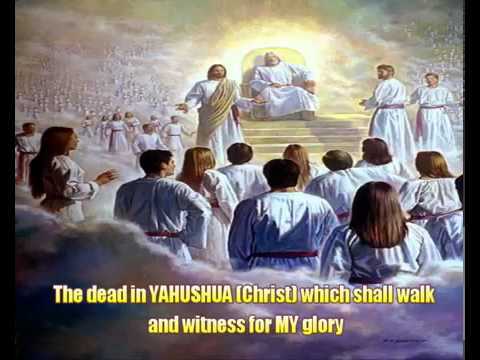 The circumcision of YAHUSHUA HA MASHIACH at this time indicates how He had come to fulfill the Law (TORAH) and the Prophets (Matt. 5:17-18). 39 “So on the fifteenth day of the seventh month, when you have gathered in the fruits of the land, you are to keep the Feast of Adonaifor seven days. The first day is to be a Shabbat rest, and the eighth day will also be a Shabbat rest. 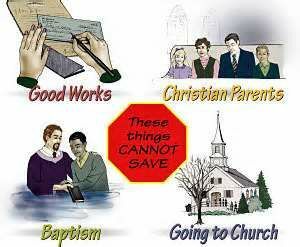 17 “Do not think that I came to abolish the TORAH or the Prophets! I did not come to abolish, but to fulfill. 18 Amen, I tell you, until heaven and earth pass away, not the smallest letter or serif[a] shall ever pass away from the TORAH until all things come to pass. a. John 1:14 states that the “Word became flesh and “dwelt” with us. The Greek word “dwelt” [skeinao] comes from the word skeinos, which the LXX (Septuagint) uses for the mishkan (tabernacle). The name given for the feast of Tabernacles itself is called Herotei Skeinon in the LXX. b. King Herod most likely would used the opportunity of the Festival of Sukkot (in Jerusalem) to perform the census. It would not have been on Chanukah (which falls around December 25th on the Gregorian calendar) since he detested and feared the Hasmoneans. c. Shepherds would not be out with their sheep in the dead of winter in Israel. The angel who appeared to the shepherds said, “Do not be afraid. I bring you good news of great joy that will be for all the people” (Luke 2:10). Since Sukkot was known as both a festival of joy and also as the “Festival of the Nations,” the angel was actually giving them a greeting for the Festival of Sukkot. d. We know that Jesus was 30 years old when He started His ministry (Luke 3:23) and assuming (as many Bible scholars do) that He ministered for 3 1/2 years, we can count backward from when He was crucified (month of Nisan) to arrive at His birthday falling in the month of Tishri, when Sukkot falls. e. The Catholic church in 336 AD declared December 25th on the Julian calendar to be Jesus’ birthday in order to replace a pagan Roman holiday, Saturnalia. Ironically, December 25th was a celebration of the birthday of the sun god. The early church, in an attempt to get rid of the pagan holiday, declared December 25th to be the birthday of the Son of God. f. The Scriptures teach that someday, when the Lord returns, that the nations of the world will all celebrate Sukkot — in fact, will be required to celebrate? Sukkot (Festival of Booths / Feast of Tabernacles) has already been set apart by YAH in Scripture to be the only Feast of Israel that all the nations of the world will one day celebrate — and not just by the Jews, but by all the nations of the earth (i.e. Gentiles), required if those nations are to receive rain. “A day of the Lord is coming when your plunder will be divided in your presence. I will gather all the nations against Jerusalem for battle. The city will be captured, the houses looted, and the women raped. Half the city will go into exile, but the rest of the people will not be removed from the city. 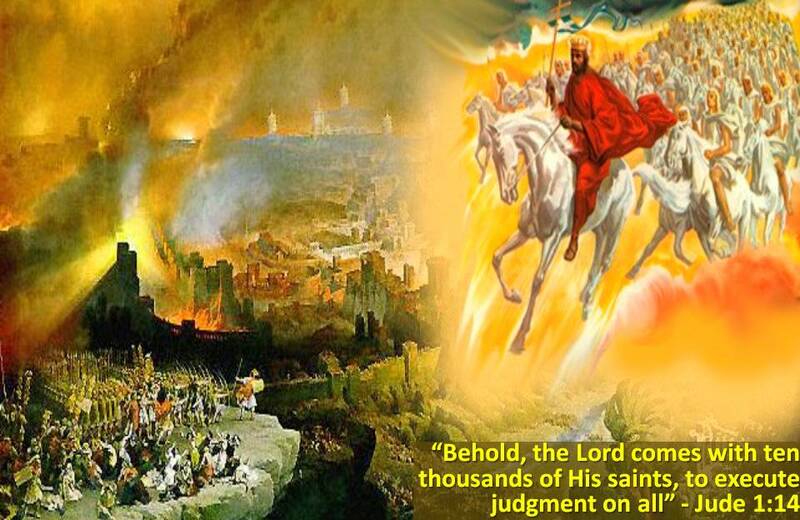 Then the Lord will go out to fight against those nations as He fights on a day of battle. Then it says that the Lord Himself will return and set His feet on the Mount of Olives. Just after the battle where the nations of the world come against Jerusalem — the Lord’s feet will stand on the Mount of Olives…now remember, this is an Old Testament passage. 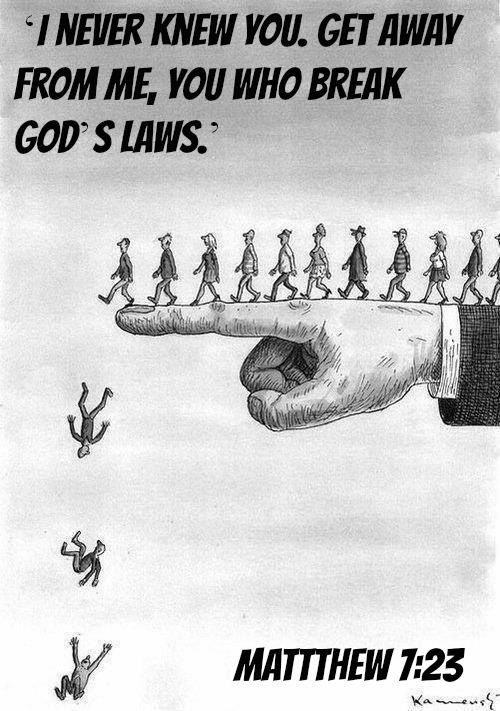 The Lord’s feet? Luke 24:50 indicates that the Jesus ascended into heaven in the vicinity of Bethany — which is on the east slope of the Mount of Olives. Yes, Jesus will come in the same way as He was seen go into heaven — to the Mount of Olives. This is the Lord’s return — when none else than God Himself will become King over all the earth and only His Name will be exalted. It says that the survivors from the nations that came against Jerusalem will be then be required to go up to Jerusalem year after year to “worship the King” and “to celebrate the Festival of Booths” and if they don’t, they won’t get rain. Then all the survivors from the nations that came against Jerusalem will go up year after year to worship the King, the Lord of Hosts, and to celebrate the Festival of Booths. Should any of the families of the earth not go up to Jerusalem to worship the King, the Lord of Hosts, rain will not fall on them. And if the people of Egypt will not go up and enter, then rain will not fall on them; this will be the plague the Lord inflicts on the nations who do not go up to celebrate the Festival of Booths. Why would God require the Festival of Booths to be celebrated by the nations — by the Gentiles and not only the Jews? Why not Passover, when He gave His life? Why not FirstFruits when He rose from the dead? Why not Shavuoth / Pentecost when both the Law and the Holy Spirit were given? Why Sukkot? Could it be that this will be when the nations of the world will celebrate His birthday on His birthday — and not as they do now, on December 25th? We outlined above that Jesus will return to the Mount of Olives, but when? Understand we are NOT taking about the day and the hour of His return — which Scripture says that only the Father knows (Matt 24:36, Mark 13:32) but the time of year, the season. “For the Lord Himself will descend from heaven with a shout, with the archangel’s voice, and with the trumpet of God, and the dead in Christ will rise first. Then we who are still alive will be caught up together with them in the clouds to meet the Lord in the air and so we will always be with the Lord. The Jewish calendar is a lunar calendar, therefore each year, the day that Rosh Hashanah falls is different. Assuming that He will return on one of these Feasts of Trumpets does not indicate what day that is; as that depends on the year. It could be a Tuesday, a Monday, any day, even a Shabbat.